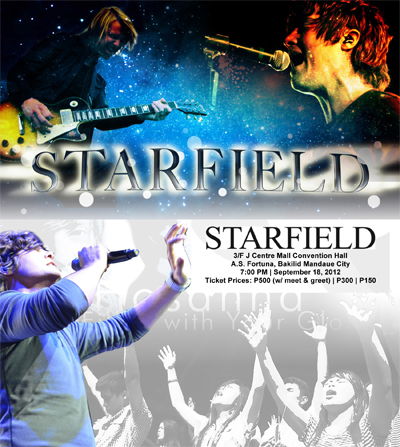 Praised God with Music and Prayers, level it up with one night worship concert with STARFILED on September 18, 2012 at J Centre Mall Convention Hall Mandaue City Cebu. Starfield is a Canadian Worship and Christian band with recogntions in Canada, the US, United Kingdom, and Europe with yearly concert tours and conference appearances. Starfield famous praise and Christian songs are "HOSANNA", "THE SAVING ONE", "ALIVE IN THIS MOMENT", "SON OF GOD", "THE KINGDOM", "I WILL GO", "FILLED WITH YOUR GLORY", "REIGN IN US" and "UNASHAMED". Starfield is led by brothers Tim and Jon Neufeld, Starfield has spent the last 10 years partnering with churches and ministries, leading students and congregations in passionate and energetic worship. 2010 - “The Saving One”. The Starfield One night Worship Concert in Cebu is brought by Becca Music, Inc. Becca Music, Inc. is a ministry that provides Christian worship concerts and conferences that minister to local churches throughout Southeast Asia. Starfield will also be sharing their testimony and give an altar call during the worship event concert. Starfield has gone beyond the music industry and more directly into partnerships with the local Church, Starfield made an incredible debut in Manila at Saved Festival 2011, now Starfield will be coming back to usher the Filipino people once again into the presence of The Saving One. Comment down below if you want a sample mp3 of Starfiled band's music. Post your email below and I will give you link to download mp3 of Starfield Praise hits and share to your friends. 3 comments: on "Starfield One Night Worship Concert in Cebu, Iloilo and Pampanga"
@Mark Falcon, I'd sent the audio sample through your email. who can I ask for more details about the concert?